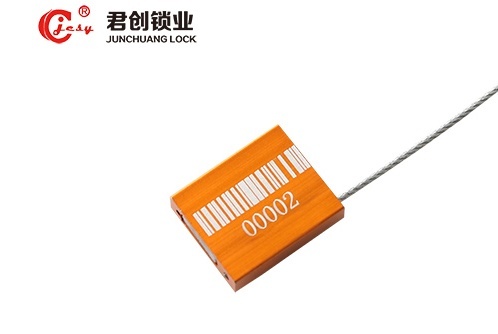 Shandong Junchuang Lock CO.,LTD series of cable seals for industrial and commercial applications around the world, in the most adverse environmental conditions, engineering safety and productivity. Our global offering provides solutions for virtually any type of cable used in hazardous and industrial environments. These cable glands are designed to strictly comply with international standards and standards. Cable gland Anodized aluminum alloy body with corrosion-resistant, high-quality galvanized steel aircraft cable designed to withstand harsh environmental and climatic conditions. Use only cable cutters to remove seals for trailer doors, tankers, cargo containers, and shipping containers. Annealed cable ends allow for easy handling and insertion of cables. Non-cut cables appear after cutting to prevent reuse, Easy to package, easy to record and manage seal distribution.